Thursday, February 14: Valentine’s Celebration in the morning. Wear pink and red! Scholastic book orders: feel free to place any online scholastic book club orders using first time classroom activation code: H2NGF; any books purchased through Scholastic help us earn points to buy books for our classrooms! Great America ‘Read to Succeed’ contest: FEBRUARY 17TH IS THE LAST DAY WE WILL BE ABLE TO ACCEPT FORMS. 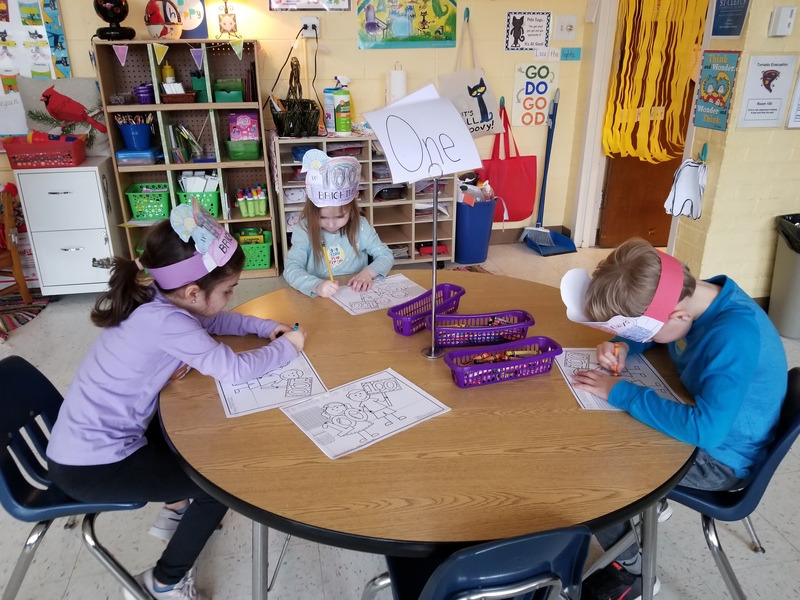 We had so much fun celebrating the 100th day of school. Be sure to check out the pictures page! Are you following St. Cletus on Facebook and/or Instagram? You may see pictures of our kindergartners there too! We will begin to work on 2nd trimester assessments. We will be busy getting ready for Valentine’s Day! Our handwriting skills are improving! We are finding it so much easier to read journal entries. We will continue to work on starting our letters from the top. Journaling: Our current goals are: 2+ sentences and/or using the word “because” to expand our thinking. We are also looking for ending punctuation, correct spelling of word wall words and independent spelling of all other words. We say to the children, ‘write the sounds you hear,’ all the time. Please do this at home too! Valentine stories at the listening center! Center time is always a great way for us to practice our January/February word wall words! Be sure to look for them at home in books! Our main focus right now is ADDITION! We are movin’ and groovin’ to our doubles song as we learn to quickly give the answer to math problems like 2+2 and 4+4. Next week we will introduce another way to write addition sentences, up and down or vertical. We will continue to practice writing addition sentences and solving them using different strategies. This will lead into subtraction which begins the next week. At home: practice counting on from a number other than 1. For example, you say 15, and your child must count on to 30. Find ways to practice addition concepts like counting on. “We have two plates on the table, how many more do we need to get to four” etc. Review counting by 2s, 5s, 10s and 1s. We still need more practice with counting by 2s. Practice at home! Next week, it will be all about the LOVE! God shows His never ending love for us each and everyday! We must be sure to LOOK! God also asks one thing of us…LOVE ONE ANOTHER! Has your child put a heart on his/her mitten? Ask your child how he/she has shown God’s love at school! We hope you’re seeing God’s love at home too! Has your child been the meteorologist yet? If not, it’s coming! Ask your child about our daily weather watch.